Blue Bell Brides cake ice cream. Summer is the most important ice age. It is also the high season of the wedding. And if you are an ice lover who is getting married, get ready: "Yes!" To say Blue Bell's newest taste - wedding cake. Wedding cake is an almond ice cream with pieces of white cake, surrounded by a rich amaretto-cream glaze against which no one will protest. By mixing the scent of the wedding cake with ice, it truly combines the best of both worlds. Of course, there should be a friend for every friend. 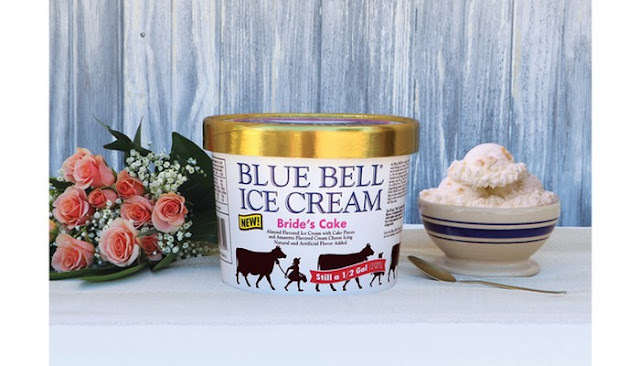 Blue Bell has also announced that it will bring back the cake, ice cream from the Groom. This taste is chocolate ice cream with chocolate cake and chocolate-coated strawberry hearts surrounded by strawberry sauce and chocolate glaze. But please walk quickly through the aisle of your supermarket! Both flavors are only available for a limited time. Novell presents, wedding rings made with Argentium Sterling Silver. Novell presents new designs of wedding rings in Argentium Sterling Silver. See the Novell wedding ring at Boone and Sons Holiday Jewelry Show. Print the Boone and Sons Facebook ad and receive a 10% discount on the Boone and Sons McLean Holiday Jewelry Show! You only have to see 10 wedding cakes! Make your wedding cake as beautiful as your wedding day! Chris is an ice critic who is extremely loyal to the brand. Chris takes samples and judges Blue Bell Ice Cream in a delightful, hilarious way known to be viral and eliminates the shelves of Blue Bell flavors he thinks worth seeing. Google's "Ice Cream Reviewer" and Field appear as second results on the first page. This is my independent review of the new Blue Bell Ice Cream wedding cake, ice cream that was released this week, while bringing back the taste of their wedding cake. Note: I am not officially associated with Blue Bell in any way, except that I am a Texan who eats (a large part of) his ice cream. I was not paid for this assessment unless I charged ice on a Tuesday (which would be reasonable). Blue Bell describes the Bride's Cake as "a beautiful almond ice cream with pieces of white cake surrounded by a rich swirl of amaretto and cream cheese glaze". And that's true in the facts. What they do not say on the container is that every bite always gets goose bumps when 'Here Comes The Bride' begins to reproduce. Do you know how everyone gets up at this moment of the wedding? This is more or less the same effect that this ice has on you. Suddenly you realize that you are pushing your neck and neck to the next freezer to show the necessary respect and admiration for this divine moment. In the first place you may wonder if the glaze of Amaretto has been lost in one way or another. But it is there. Subtle, soft, hidden. Just like that weird lace thing that brides always wore on the leg and then let the friend stand out from everyone else (how come we happen to happen by chance?). The white cakes really bring that full circle. Soft and light like the purse of the bride's father. Chocolate a little strawberry, and then a little more chocolate. The strawberry sauce strudel adds the right note of nervousness, something like those Superman socks that all godfathers wear and hide from the mother of the bride. Now these products can be sold separately, but it seems wrong to eat them alone.